It’s not often a support act outshines the headliner, but when the support act is the headliner performing stripped down acoustic versions of often ignored songs from their back catalogue, the rules are changed slightly. Stripping everything back brings out the raw intensity and emotional qualities in a band’s music, and when the songs are as personal as Broken By The Hurt it’s particularly potent. 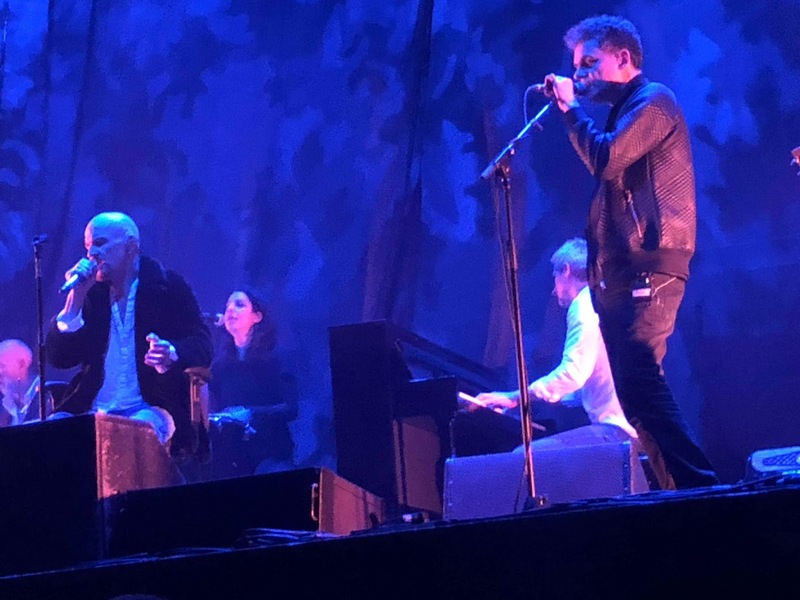 Tim’s unable to complete first time round with having to stop and pause, first with Saul continuing to play acoustic before they stop and start the song again, which means we’re treated to Andy’s haunting trumpet intro for a second time. Equally affecting is Coming Home (Part 2) where Mark’s piano really accentuates the feeling of separation of father and son. You can sense the tension hanging in the air as the simply lit backdrop perfectly compliments these songs. Pressure’s On feels claustrophobic, right on the edge of breakdown as Andy and Chloe’s vocals add lift to the section where “cry” is repeated, piercing the expectant air. Things lighten up a little for Just Like Fred Astaire, a song Tim tells us has been used at many weddings, even though he wonders if the middle section of “he said love is just a disease, a plague for the naive”is edited out. The Newcastle audience care little, clapping throughout, as the song’s versatility is demonstrated. All I’m Saying follows, restoring the theme of death to the set, after they joke they have a song for any occasion, Saul’s daughter appearing on stage to leave him a bottle of water just as Tim says children find his swearing funny. Again, Mark’s piano opening perfectly captures the emotional wringer that Tim puts himself through singing about the death of one of his closest friends. They finish with Hello, a song that has benefitted more than any from these reinterpretations. With Saul’s violin and Adrian’s cello accompanying that plaintive piano, there’s a hushed reverence around the hall that explodes into rapturous applause at the end. The seated venue proves at times as much a handicap to the audience as the ankle does to Tim. Movement is restricted, there’s a fight down the front during the second song Busted as people try and get into the space between seats and find place to dance, and it feels like people are reticent to get involved. 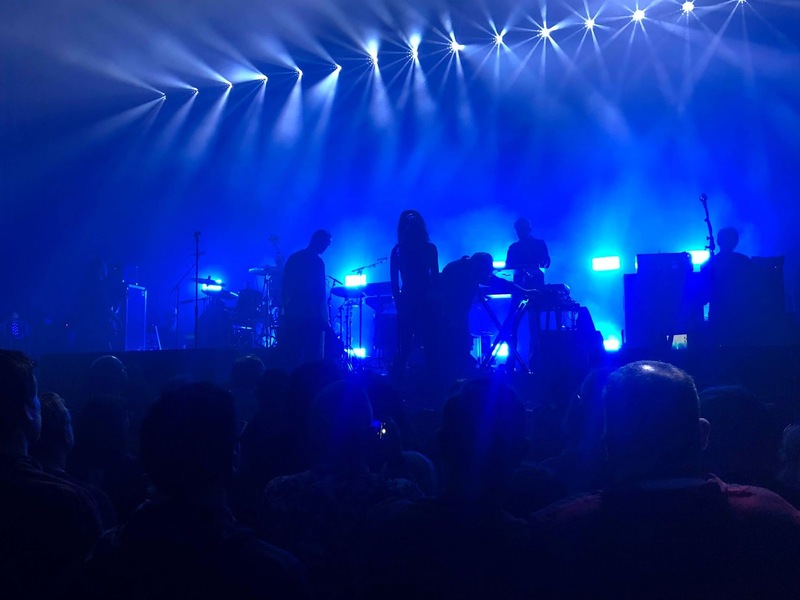 There’s plenty of valid reasons why seated gigs work, but for a band like James which channels energy from stage to audience and then back again, it feels like it dampens the euphoria slightly. Ring The Bells gets more people up, you watch Tim look desperate to let loose as he waves his crutch up in the air and the top half of his body gyrates in time to the accelerating pace of the song. He urges those still seated or who thought they were coming to watch James Arthur to join in or go home at the end of it. He then sits down and sings Five-O in his chair, spinning round making it part of the act. He’s given a cup of tea at the end to help with his voice and comments that it’s more like the Val Doonican show. They start Moving Car before a screaming girl down the front on the other side from the fight brings things to a halt by completely distracting Tim. The venue staff intervene and remove her during the song, so Tim suggests that there should be a holding pen for people who misbehave during the gig. The song itself is a wonderful twisting journey song that never comes back to the same point and even if it didn’t make the album proper feels like it’s very much connected to the mood and intent of it. Heads is one of the album’s highlights and live it flourishes even more. Harsh, metallic and pugnacious in its onslaught, taking aim at the white American dream of Trump culture, the message of “we bought into this crap that we can’t take back” feels like it captures the zeitgeist of the moment here as we approach the last two weeks before a no-deal Brexit could become a reality. A new band creating such a sonic maelstrom would be hailed from the rooftops as groundbreaking. Picture Of This Place probably suffers more than any song from Tim being hamstrung by his injury, yet at the moment when the song stops, everything goes dark and then explodes back into glorious yellow light, it adds fuel to the argument that James have created their most sonically exciting and adventurous record ever in Living In Extraordinary Times. They don’t forget though that they have a history and a legacy that people have grown up with over the years. Getting Away With It (All Messed Up) has become something of a theme song for the band, and although it was released at the tail end of James’ years with Mercury before the 2001 split, it retains a special place in the hearts of longer-term James fans. Tim sits down on the monitor at the front, body swaying from side to side as he drinks in the love emanating from the stalls as they threaten to drown out the band. An almost off-key keyboard ushers in a gorgeous stripped-down version of Sit Down, a genuine moment of communion, connection between band and audience. It might have been overplayed to death, hung round the band’s neck like an albatross at times, but at moments like it is impossible to deny that few if any songs capture a feeling of community, friendship and we’ll all be alright if we stick together. There’s discussion about what to play next, Tim toying with the crowd as he tries to have a discussion with the rest of the band without giving away the choice they’re making. Johnny Yen is the result, a thirty-three year old track that still resonates today around the hedonistic nature of the rock and roll lifestyle and the way it consumes artists whole. It was never a single, but you’d never know that or its age from the reaction it gets. 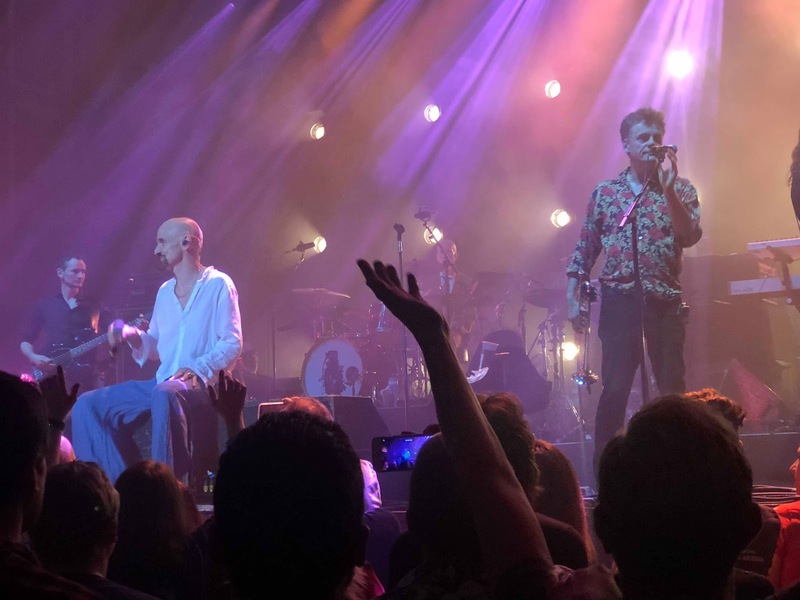 As it races to its improvised end, Jim and Adrian close ranks, close enough to play each others instruments and Tim, Saul and Andy congregate centre stage in a similar manner. Tomorrow, or “the T song” as it’s described in the discussions, follows, Saul’s guitar opening adding new life and extra pulse to the racing nature of the song as the band let loose and the crowd follow suit as best they can around the chairs that constrain them. “This should have been the lead single off the album but the record label fucked up” is the introduction to Leviathan and an irrevocable statement of fact. Soaring, glorious and uplifting, it stands up against any single they’ve ever released and the audience around us either agree or are coerced by hearing it for the first time. As it reaches the breakdown and stop, the lights go down and Tim and Andy repeat the “ride inside your starship, never quite the same trip, don’t wanna be alone written on my headstone” mantra in increasingly hushed tones before stopping dead and the chorus crashing back in like huge waves hitting the shoreline. Come Home follows and sees Andy and Chloe prowling the stage, encouraging the crowd to let themselves go and lose themselves in the music. Tim tells us he’d have been up walking on the balcony if his foot was OK. They finish the main set with Attention, everyone being bathed in blue and turned with their back to the audience as it hits the middle section where Mark takes over and it builds back into the exultant conclusion to both the song and the set. There’s no way Newcastle are going to let them go though and when the singalong kicks in to Many Faces at the end and threatens never to stop and the band gaze over a sea of arms declaring that we’re all one big family under the skin, it feels like there’s a beacon of hope in these troubled disaffected and disconnected times. 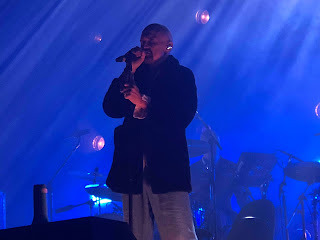 The night finishes with Sound, full of improvisation from Saul’s agitated guitar that adds new life to the verses through to a full five minute refrain that appears to start because Andy’s walk through the balcony takes longer than anticipated and he’s not back on stage. Whatever the reasons, it sees the band feeding off each other, searching to take the song in a different direction, Saul yelling into his microphone before looking to find someone to take them off on a tangent. It might not be a rousing singalong conclusion to the gig, but as the strobes fly around, it’s even more potent. James played an acoustic set of Coming Home (Part 2), Pressure’s On, Broken By The Hurt, Just Like Fred Astaire, All I’m Saying and Hello before an electric set of What’s It All About, Busted, Ring The Bells, Five-O, Moving Car, Heads, Picture Of This Place, Getting Away With It (All Messed Up), Sit Down, Johnny Yen, Tomorrow, Leviathan, Come Home, Attention, Many Faces and Sound. James' tour continues at Edinburgh Usher Hall (18), Carlisle Sands Centre (20), Birmingham O2 Academy (21) and Hull Bonus Arena (22) before they play Porto Coliseum (April 3), Lisbon Coliseum (4), Thessaloniki Fix Factory (June 7), Athens Release Festival (8), Isle Of Wight Festival (14), Manchester Heaton Park (15, supporting Courteeners), Eastnor Castle Lakefest (August 11), Edinburgh Princes Gardens Summer Sessions (15), Doncaster Racecourse (17), Hardwick Live (18) and Knebworth Cool Britannia (31).